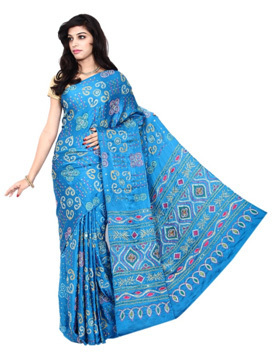 Indian saree is a very versatile outfit. It can turn into a gown, a dress or a skirt. If you know the art of draping then you can play around with this 6 yard of fabric the way you want! Draping a saree is an art and hence doesn’t have a thumb rule about it. You can drape a saree in many different styles. Now-a-days designers have come up with many different techniques of draping a saree. Try out the new dhoti style drape. This is a very trendy draping style and has been spotted on many leading Bollywood actresses like Sonam Kapoor. The deal is that instead of a petticoat you need to wear leggings or pants with this look. It is non-fussy and relaxed. It gives a young feel to the overall look. You can also opt for Mermaid Style which is chic and modish. You have to drape the saree like you normally do but just keep it sleek and tight from the end. This will give a mermaid look to the saree. It is unique and beautiful. 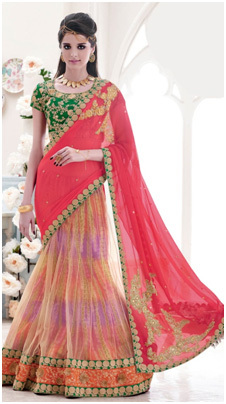 If you want to keep it modern yet rooted then wear your saree in a Lehenga style. This is perfect for a wedding. Many brides are spotted in this style of draped saree. It is less fussy and more comfortable. 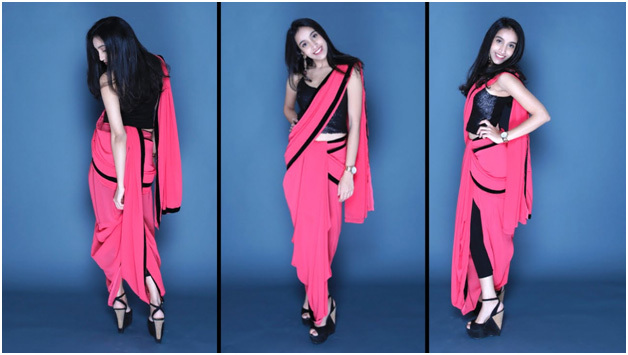 A traditional way of draping a saree with a twist is here! Twirl your pallav and cling it on the shoulder. You can even make a knot on the end of the pallav. Or maybe a knot right at the shoulder. This is a very cool style of wearing a saree and can be done with sarees in a light fabric like chiffon, georgette, net etc. Make a fashion forward statement with cinching a belt at the waist. You can choose between a slim or broad belt. You can also opt for a shimmer or metal belt which is trending this season. You can also go matchy-matchy with the color of your saree or totally contrast like a black belt on a white saree. Drape your saree as you do usually just criss-cross it on the bodice and pin it to a side. This is a very stylish way to drape your saree. This look will stand out among the crowd and is sure to make heads turn! These are the various styles of draping a saree. So go ahead and keep on experimenting with your drapes! Stunning styles to wrap saree. I have observed that Saree is entering back in hi-fashion with indo-western style. Great style for Saree lovers.